Introduction: Little Becca would be pretty jazzed to know that adult Becca would be putting on art shows. Not only am I having my artwork at shows, but I'm also selling it. How fancy does that sound? 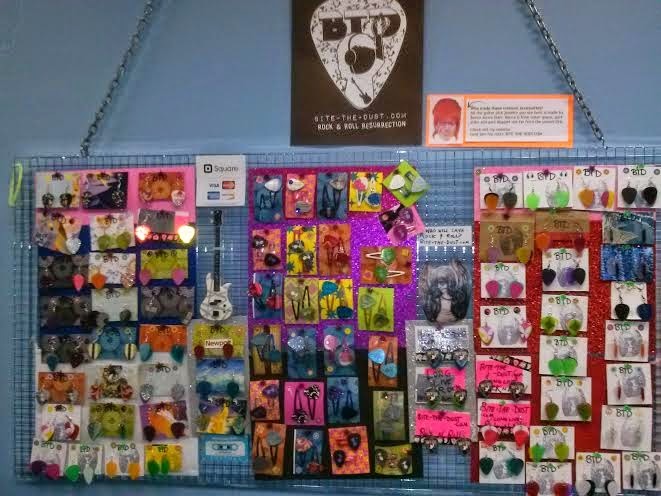 One of the neatest by-products of making guitar pick jewelry is meeting other music fans. To me guitar picks have always been my favorite symbol of rock and roll and it's a tool to make something happen (music!). I've went crazy making things and refining the ways I do them. Art is an interesting thing that like anything else if you keep at it you get better and better. I have a friend who does Ukrainian Egg art, which is extremely detailed, delicate and time consuming. I would never have the patience for it. Her first egg I was impressed with, and over he past 2 years her lines and colors have improved greatly. Like a true human being she doesn't see it, like most artists she just sees the flaws. Makes me think of our parents telling us "practice makes perfect." That's basically true. If you stick with something you are basically guaranteed to improve. I do not believe in perfection itself though. I stuck with it, and eventually listened to the positive encouragement of the people around me. It's so easy to be doubty and think what you create is crap. Chances are you are the only one who feels that way [about your own art]. I've learned a lot of lesson's while doing them. One of the biggest recommendations I can make it to reach out to local art galleries. The absolutely worst thing they can say is "No" and no is fine. In December I planned the 11th anniversary bash for Bite-the-dust.com where I had my first art show. 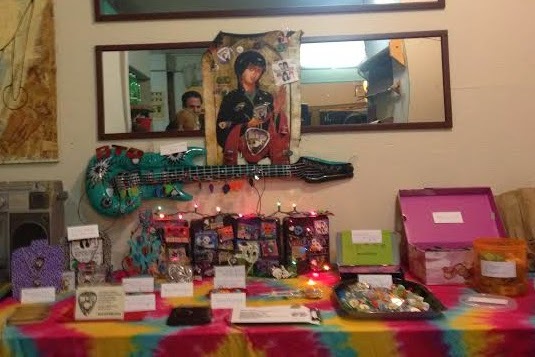 I sold a few pieces, and since I was the ring leader of the event I had my hooks and attention in many places. My second art show at Blow Salon on April 19th 2014 was with other artists so I was able to focus on that. I got a chance to talk to folks and network and feel warm fuzzies. The more wine people drank the more they bought. I was amazed although not surprised by this simple equation. I made a point to not get too tispy so I could still be an effective sales person and keep an eye on my merch. Having one of my jobs currently be retail, I feel like "people are gonna steal so I'll be on high alert". But it was an art show, not a shop at the mall...so it was way cooler. My display from 2nd art show on April 19th 2014. I was able to sell at least 10 pieces which was a nice surprise. Most of the other artist had medium to large beautiful detailed paintings and collages...while my art was small. So small I had to "make it bigger" by fluffing it up with a display, which tapped into my display job experience. Shazaam! That was an interesting process that lead me from Michael's to Home Depot, I finally found a large shiny piece of plastic in the lighting section. Forgot what it's called, but after adding foam pieces it worked great. My jewelry is also available in my Etsy shop: Rockresurrection. Don't expect anything, but plan ahead just in case. Get folks to sign up for your online newsletter by leaving a sign up form on the main table when they enter. Don't clutter up your display. This will give people option anxiety and they wont know where to start. I recommend a wide range of product prices so there is something attainable for everyone. There's usually at least wine at art shows, the more inebriated people are the more likely they are to buy. Make sure you have water and some snacks. Do a demo at your table to get people's attention. They'll also learn about your product. 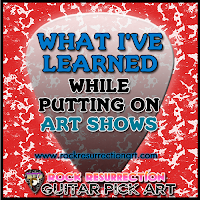 Make sure to give your art its proper value, meaning don't under value or over charge for it. Make sure to consider not only the supplies but the TIME you put into it. Have your business card on hand at all times. Hand one to each of your guests when they come in. The sooner you start inviting the better the turn out will be. Take an inventory before you bring your art in for a show or consignment. You need to know what you have and what you end up selling. Don't feel too shy to talk to people, mingling is a big part of what art shows are about. It's a great chance to meet other artists and network. (If there's a contract) READ THE CONTRACT. TWICE.